The Mercedes-Benz W136 was Mercedes-Benz’s line of four-cylinder automobiles from the mid-1930s into the 1950s. The car was first presented in public in February 1936, although by that time production had already been under way for a couple of months. Between 1936 and 1939, and again between 1947 and 1953 it was the manufacturer’s top selling automobile. After the Second World War the W136 became the foundation on which the company rebuilt, because enough of the tooling had survived allied bombing or could be recreated. 1949 saw the arrival of the Mercedes-Benz 170S version of the W136. This model is in retrospect sometimes celebrated as the first S-Class Mercedes-Benz. It was a more luxurious, costlier and, when launched, slightly larger version of the mainstream model and the manufacturer made an effort to maximize the differentiation between the two. The Mercedes-Benz 170 Sb and 170 DS were even given a different works number in 1952, being internally designated between 1952 and 1953 as the Mercedes-Benz W191. 1955 was the car’s last year of production. Its replacement, the W120 had already been on sale since July 1953, after which the older model was repositioned in the market as a lower priced alternative to the new one. The Mercedes-Benz 170 SV and 170 SD were also built briefly in Argentina from 1952-1955 in sedan, taxi, pick-up and van versions. Mercedes-Benz W136 is the name, using the manufacturer’s works number, under which the car is frequently known in retrospect, but the car introduced early in 1936 was known as the Mercedes-Benz 170V. It replaced the six cylinder Mercedes-Benz W15, which at the time had also been known as the Mercedes-Benz 170. Despite having a similar engine capacity of 1.7 litres, the new car’s four cylinder unit was more powerful. Technically and stylistically it was far more modern and could be sold at a lower price. Between 1936 over 75,000 were built making it by far the most popular Mercedes-Benz model up till that point. The "V" in the 170V’s name was short for "Vorn" (front) and differentiated the car from the contemporary Mercedes-Benz 170H (where "H" was short for "Heck" or rear) which used the same four cylinder 1697cc engine, but positioned at the back of the car. Claimed maximum power output was 28 kW (38 PS) at 3,400, using a compression ratio (during the car’s early years) of 6:1. The side-valve four cylinder engine consumed fuel at the rate of less than 10 litres per 100 kilometres (28 mpg-imp; 24 mpg-US). The motor was attached using just two mountings and ran with a smoothness hitherto unknown in a four cylinder unit. Most of the cars produced, and an even higher proportion of those that survive, were two or four door "Limousine" (saloon/sedan bodied cars, but the range of different body types offered in the 1930s for the 170V was unusually broad. A four door "Cabrio-Limousine" combined the four doors of the four door "Limousine" with a full length foldaway canvas roof. Both the foor door bodies were also available adapted for taxi work, with large luggage racks at the back. There was a two door two seater "Cabriolet A" and a two door four seater "Cabriolet B" both with luggage storage behind the seats and beneath the storage location of the hood when folded (but without any external lid for accessing the luggage from outside the car). A common feature of the 170V bodies was external storage of the spare wheel on the car’s rear panel. The two seater roadster featured a large flap behind the two seats with a thinly upholstered rear partition, and which could be used either as substantial luggage platform or as a very uncomfortable bench – the so-called mother-in-law’s seat. In addition to the wide range of passenger far bodied 170Vs, a small commercial variant was offered, either as a flatbed truck or with a box-body on the back. Special versions of the 170V were offered, adapted for use as ambulances or by the police, mountain rescue services and military. Production restarted in May 1946. The vehicles produced were versions of the 170V, but in 1946 only 214 vehicles were produced and they were all light trucks or ambulances. Passenger car production resumed in July 1947, but volumes were still very low, with just 1,045 170Vs produced that year. There was no return for the various open topped models from the 1930s. Customers for a Mercedes-Benz 170V passenger car were restricted to the four door "Limousine" sedan/saloon bodied car. Production did ramp up during the next couple of years, and in 1949 170V production returned to above 10,000 cars. From May 1949 the car, badged in this permutation as the Mercedes-Benz 170D, was offered with an exceptionally economical 38 PS (28 kW; 37 hp) diesel engine. The 170D was the world’s third diesel fueled passenger car, and the first to be introduced after the war. 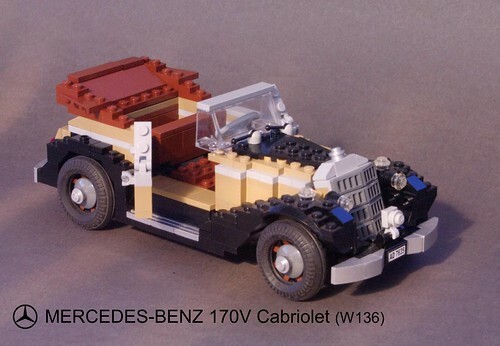 This Lego miniland-scale Mercedes-Benz W136 170V Cabriolet has been created for Flickr LUGNuts’ 84th Build Challenge, our 7th birthday, to the theme, – "LUGNuts Turns 7…or 49 in Dog Years", – where all the previous build challenges are available to build to. In this case one of the very early challenges, Challenge 11, – "Colour me Strange", – an opportunity to explore some of the rarer areas of the Lego Group’s colour palette. The Mercedes-Benz 170V shown here features bodywork in the ‘dark tan’ colour, complemented with black fenders and running boards, along with ‘reddish brown’ interior and cabriolet hood.